We have the honor to bring you gorgeous yet simple Christmas decorating ideas from some of our many friends in the blogging world. 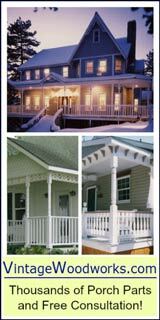 Come and enjoy the fresh colors you see on these porches: purple from Plum Doodles and a sumptuous tan color at Anna's porch. And don't miss Colleen's trio of trees and her hand-painted wreath pillow. 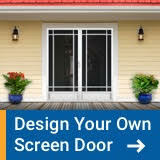 We begin with Sheila's blog, Plum Doodles, a light-hearted blog devoted to fun and faith and easy-on-the-budget decorating ideas. Plum Doodles trademark color is purple, hence you will see some beautiful shades of purple in her Christmas decorations. Do you have a favorite color to switch things up in your holiday decor? Sheila added fresh holly to her purple poinsettias wreath. 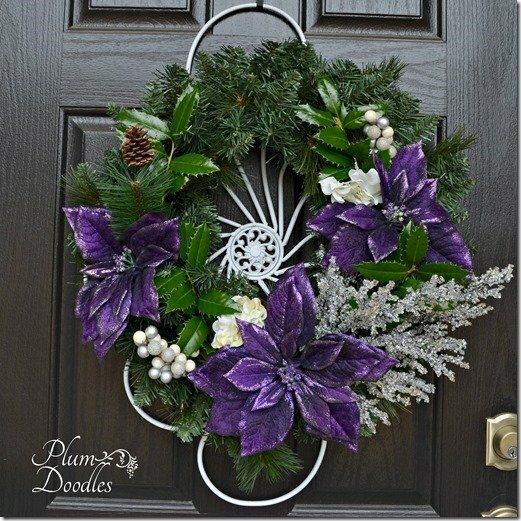 Purple brings a freshness to the front door. Adding the touch of fresh holly is a nice way to bring new life to your existing decorations. Did you get to see Sheila's autumn porch? She planted pansies and ferns in her flower pot in the fall. 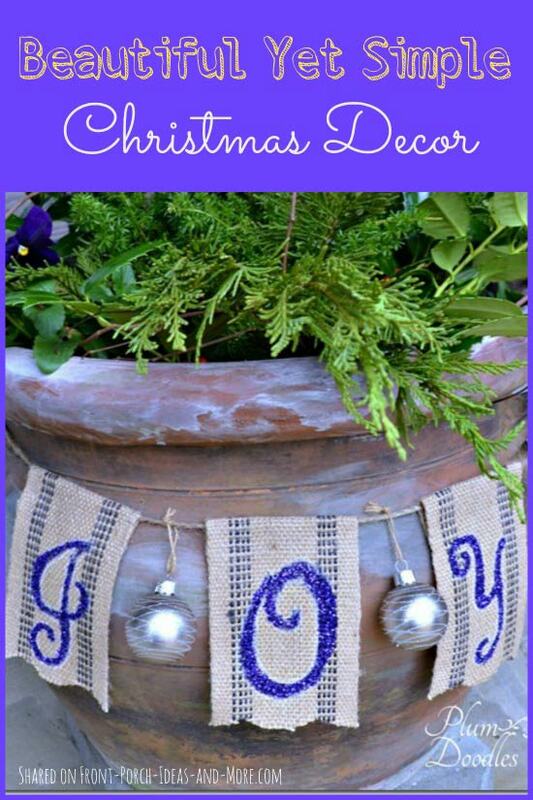 For Christmas decorating, she added sprigs of holly and trimmed the pot with a sweet handmade J-O-Y banner. A close-up of the J-O-Y banner. Sheila made this from jute webbing and purple glitter - interspersed with silver balls. The purple in the letters brings out the cute pansies peeking out in the pot. If you live in a mild climate like Sheila does, you can enjoy pansies all winter. 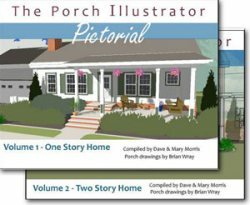 Please stop by Sheila's blog, Plum Doodles, to see more of her Christmas porch. She is a mom to two grown kids and wife to Richard. She dreams of living in a mountain home with a creek and a waterfall. We would enjoy that, too. 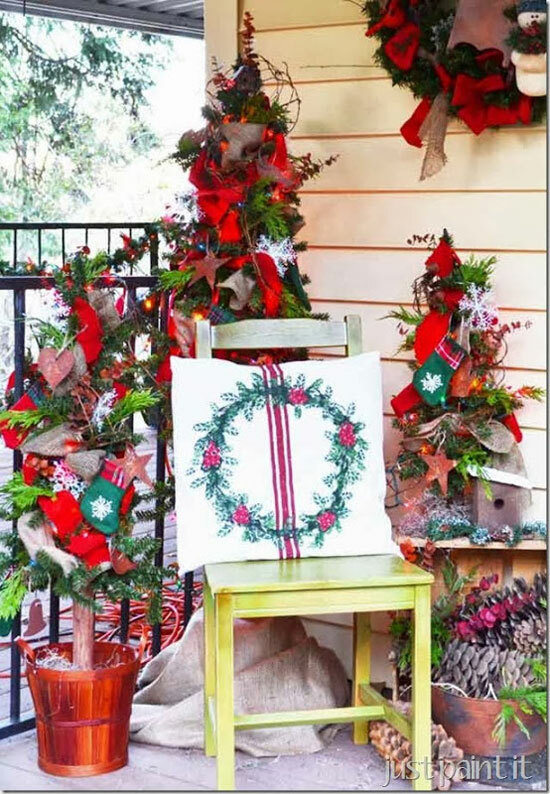 Colleen, author of Just Paint It created this magical Christmas vignette with 3 trees of varying sizes. 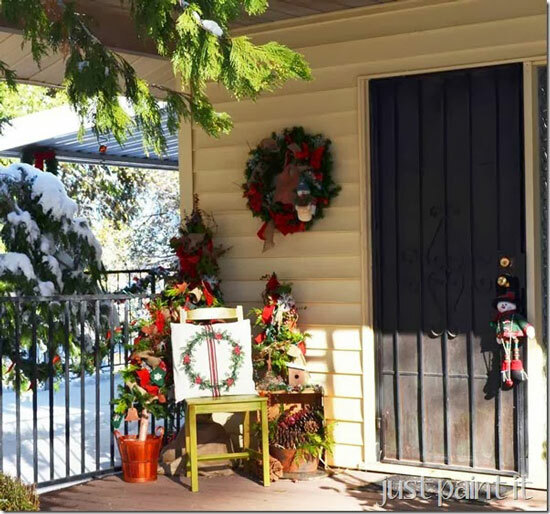 It is fun to see how she transformed her her autumn porch into this magical Christmas porch. So let's take a look at how she did this. 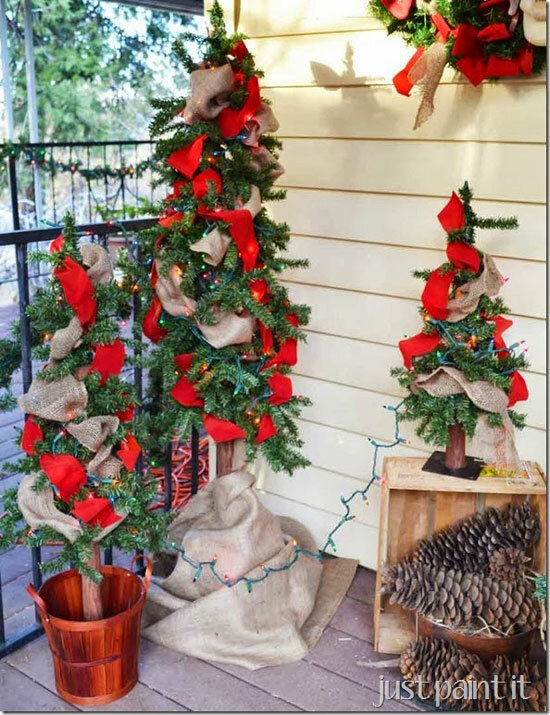 Here you see how she placed her 3 trees, each on its own pedestal and decorated with lights and pretty burlap ribbon. Notice the tallest tree is in the center. The tree on the left is in a cedar looking type of basket and the one on the right is resting on a crate (which she will decorate, too). Now she added more color by dressing the trees with pretty red ribbons. Simple Christmas decorating! 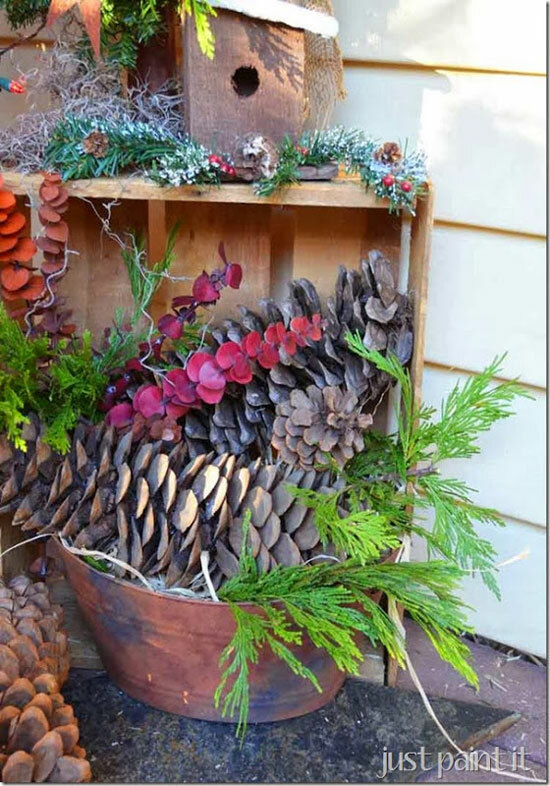 Along with the large pinecones, she added fresh greenery and a sweet birdhouse to dress up the crate. 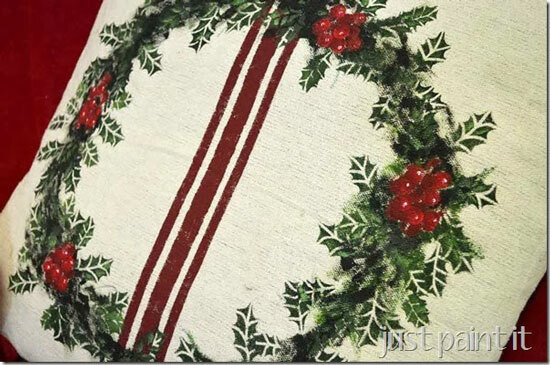 Then, using her painting skills, she painted this very lovely wreath on drop cloth fabric to create this pillow cover. Oh, and did you see the autumn leaf pillow cover she painted? We featured Colleen's autumn porch, too. Take a peek at her autumn porch. And now you can see the results of her creativity. The hand-painted pillow on that colorful wooden chair is the perfect finishing touch. 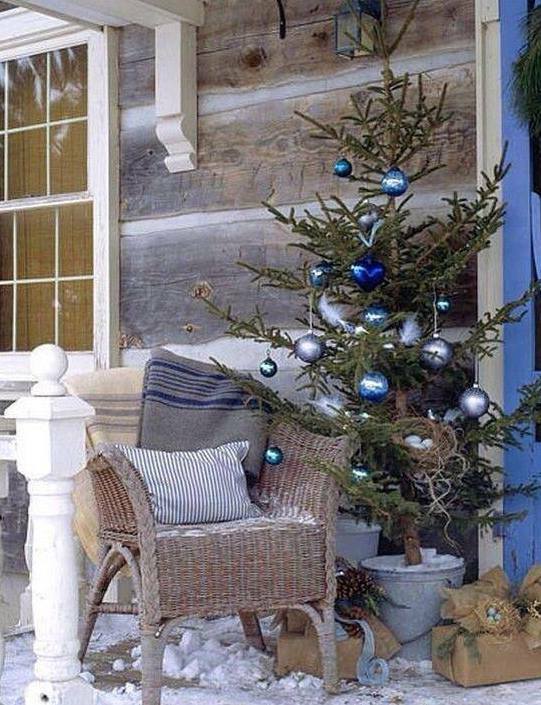 We like your Christmas porch, Colleen! And we also like the winter white blanket of snow courtesy of Mother Nature. Colleen has been painting for over twenty years. 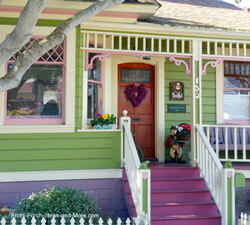 On her blog she shares wonderful ideas for using paint to dress up your home, inside and outside. What I really like are the step-by-step tutorials that she provides so that even if you're not an artist, you can learn from Colleen. 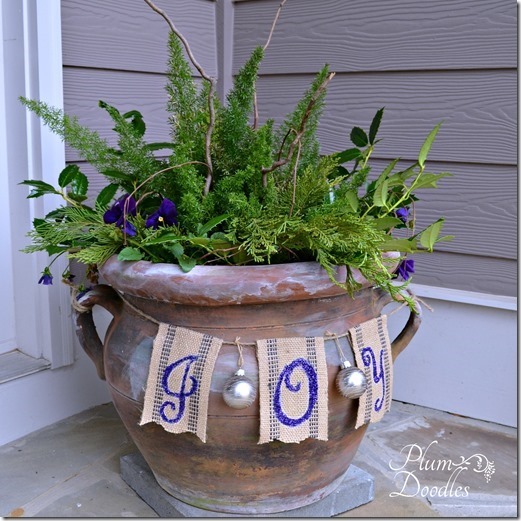 See more Christmas porch pictures on her creative blog, Just Paint It. 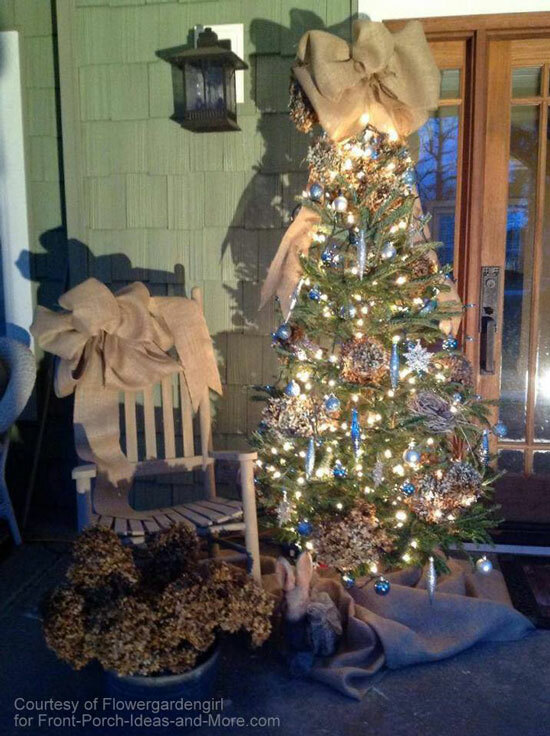 Our sweet friends, Anna and her husband Gary, created a natural wooded theme this year on their North Carolina Christmas porch. 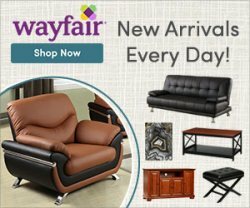 It's a gentle soft look in blues and a sumptuous tan color. We have had the pleasure of visiting Anna's porch and it is very beautiful. 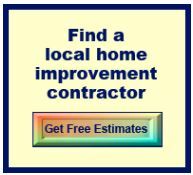 To begin, Gary painted their rocker this sumptuous tan color. That's a beautiful yet simple Christmas decorating idea using paint. Anna made the bows from natural color burlap. 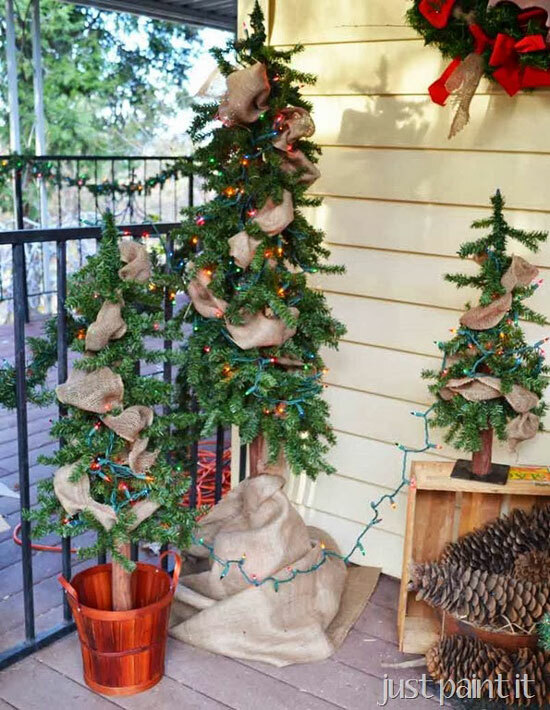 I like how they created the soft burlap skirt for their tree. If you look very closely, you can see Anna and Gary even put a little nest in their tree. It's real, too. They modeled their decorations from the photo you can see below. 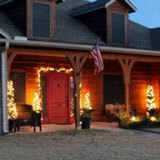 Can you see how you could create a scene like this on your porch? If anyone knows the source of this photo, please tell us so we can give credit. Thank you so much. If you know, please tell us the original source of this photo so we can give credit. Thank you. 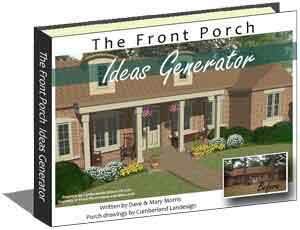 We have been honored to feature Anna's porch several times. 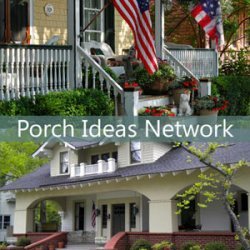 See our interview with Anna about her lovely craftsman-style home and how she decorates her porch with flowers. 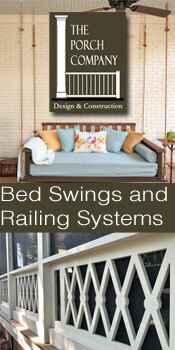 Learn more about Anna and her Flowergardengirl blog. We hope you liked these simple Christmas decorating ideas. Please share pictures of your Christmas decorations or other craft ideas for the holidays so we can share them here.